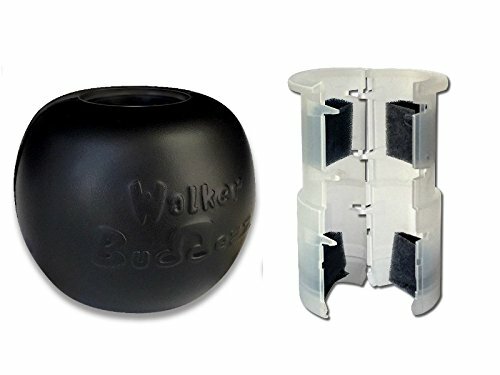 The Walker Buddezz SINGLEZZ kit comes as a single device and everything you need to attach it to your walker, crutch, cane or rollator. Add a fun SKNZZ cover(not included) so you can personalize your mobility device with ease. Walker Buddezz product line was the innovative idea of Chad Dollarhide, the creator and founder of the company. The initial idea came after spending years working in the physical therapy arena, and witnessing the horrible aftermath that slips and falls created. These issues left many patients bound to a sterile and depressing mobility aide reminding them of their situation on a day to day basis. So to add fun and whimsy, Dollarhide created SINGLEZZ, SKNZZ and FRAMZZ products so customer's could customize their mobility devices. It is Walker Buddezz' sincere hope that you enjoy these products and feel all the love that went into creating them. Get Moving: Contains a single, universal-fit kit that will attach to any mobility device. Use for traditional or two-wheeled walkers, rollators, canes, or crutches. SINGLEZZ is simple to attach so you can customize your items with SKNZZ covers(NOT INCLUDED) in less than a minute with no tools required. Add Some Fun: One thing Chad Dollarhide noticed about walker users, was their tendency to want to personalize their spaces and keep their loved ones and momentos close. Walker Buddezz SINGLEZZ makes this easy, you can personalize your mobility devices with Walker Buddezz SKNZZ covers (sold separately), which attach easily and add whimsy and a conversation piece as you go about your life. Sturdy and Functional: Keep moving day after day, as Walker Buddezz are made from durable materials that are meant to withstand usage. They don't wear down, they don't chip, and they don't tear like other products. Conversation Starter: Lets you customize your mobility device. Enhances the mind-body connection by increasing confidence, sparking conversation, and allowing you to enjoy life with your walker. If you have any questions about this product by Walker Buddezz, contact us by completing and submitting the form below. If you are looking for a specif part number, please include it with your message.